Tyres? Aren’t they just black round rubber things that you fit to your car and as long as there’s tread it’s okay? No way! Of all the safety items fitted to your car, classic and modern the most important are those black round rubber things. As you go round a corner, what is the part of your car that separates you from oblivion? It’s where the tyres come into contact with the road. No grip! That could be the end of it. So it pays to have not only the best, but also the correct size tyres fitted to your car. Russell Stuckey of Stuckey Tyre Service in the Melbourne suburb of Brunswick is passionate about tyres. Russell’s passion ensures that your car and especially your classic are fitted with the correct tyre. In fact Russell makes sure that his company can supply the tyres that other distributors just give up on. For instance did you know that 345/35 R15 tyres are made from a super rare rubber compound called unobtainium? You would if you owned an early Lamborghini, but you would also know that Stuckey Tyre Service can source them for you. 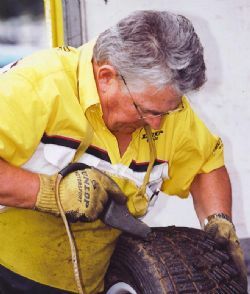 Stuckey Tyre Service was started by Russell’s father Col in 1966, who had worked for Dunlop for some years and saw an opportunity that was too good to resist. Russell joined straight from school in 1968 and immediately set out to develop the company into one that provides high quality, professional and friendly service. Then in 1972 in somewhat of a coup, Dunlop offered the company the franchise for Dunlop Motor Sport. Initially this was for Victoria, Tasmania and South Australia, but it soon expanded to the whole of Australia. Motor Sport in Australia was in a state of flux as cars got faster and racing tyres were getting wider and slicks were becoming almost standard fitting. The period also saw a growth in Stuckey Tyre Service as customers kept coming back for not only the service, but they also knew they could find the size tyre they were after. 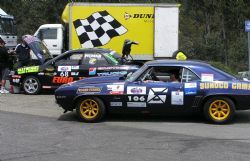 It was also the start of the Australian Muscle Car era and Stuckey’s were supplying tyres to the likes of Holden Toranas at Bathurst. Such Australian legends as Harry Firth and Peter Brock were constant visitors to the Brunswick address. 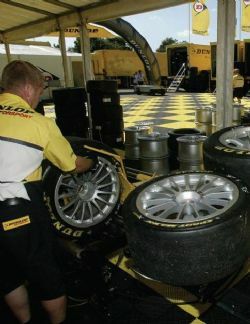 Time has moved on and Stuckey Tyre Service is still very much involved in Australian Motor Sport and in fact is Australia’s leading distributor of motorsport tyres as well as the supply of tyres for all makes and models, both young and old. Over the years the Stuckey team has developed an expertise in finding those obscure sizes from the ‘60s and ‘70s and especially those fitted to the increasing number of American Muscle Cars. Russell says that every size tells a story and is also highly mindful that tyres have to be developed and while you may want 2 tyres for a Giocattolo you may also have to be patient while a batch is produced. Stuckey Tyre Service is no longer wedded to just Dunlop and can supply tyres from almost every manufacturer around the world including Michelin, Sumitomo, Bridgestone, Yokohama, Pirelli, Goodyear, Falken, BFGoodrich, Toyo, Kelly and Kumho. Russell now has a total of 5 staff working within the Sydney Road, Brunswick outlet with 3 hoists and can provide expert fitting and balancing – without damage to today’s expensive wheels. They can also expertly fit tyres to and balance wire wheels, a skill that is hard to find these days. Plus the team knows where the weights should be correctly placed so as not detract from the appearance. They also have specialist equipment for grooving and buffing when required as well as on-car balancing. 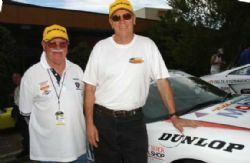 So if you’re looking for expert advice on tyres for your classic car, historic racer, V8 Supercar or even the car you drive everyday give Russell Stuckey a call on (03) 9386 5331. Don’t live in Melbourne and need hard to get tyres? Give Russell a call as Stuckey Tyre Service ships tyres to all points in Australia each day.